If I leave the raccoon alone will it just go away? Not before it does significant damage. Once a raccoon lives in your attic it will usually stay. Raccoons leave their feces and urine in the insulation and soffit areas. If that raccoon ever leaves other raccoons are attracted to that smell and will make your attic their new home. A raccoon had babies in my attic. Will the raccoon babies leave when they get big enough? The mother raccoon will let the female raccoons stay but kick the male raccoons out. This is so the male raccoons do not mate with their sisters and contaminate the gene pool. Why is raccoon removal important if they are in my attic? Raccoons will do significant damage in your attic and can be very expensive if they are not removed. They will destroy your air conditioning duct work, rip apart electrical wiring, and ruin the dry wall. Raccoons leave their feces and urine all over the insulation which produces a strong and sometimes unbearable smell. Raccoon removal is essential to prevent costly damage in the attic. I have raccoons living in my attic. There is a very strong smell coming from my wall. What is it? When animals like raccoons live in your attic they will sometimes die. The raccoon probably died in the wall and needs to be removed to get rid of the smell. A raccoon died in my attic. If I leave it there will the smell go away? Depending on the season, it could take a very long time for the smell of any dead animal to go away. In the summer, a dead animal can smell very strong for a few weeks and then start to get better. In the winter, the smell might not be as bad but could last for months. In either case, it is important to get the dead animal removed professionally. The smell can be dangerous for someone with respiratory problems and any ecto-parasites that were living on the animal need to be exterminated. Reliable Animal Removal Inc. will remove the dead raccoon, exterminate the ecto-parasites and deodorize to reduce the smell. Raccoons can look very cute but are also very dangerous. Raccoons are the number one carrier of the rabies virus on the east coast. Rabies is 100% fatal if untreated. If a raccoon bites or scratches someone the raccoon must be trapped, have its head cut off and sent to be tested. If the raccoon can not be trapped then the person who was bitten or scratched must go through a series of expensive rabies shots. Raccoon removal is necessary and should be left up to the professionals at Reliable Animal Removal Inc.
Is trapping the raccoon the only way to do raccoon removal? Raccoons are very dangerous. Raccoons are the number one carrier of the rabies virus on the east coast. Rabies is 100% fatal if untreated. If a raccoon bites or scratches someone the raccoon must be trapped, have its head cut off and sent to be tested. If the raccoon can not be trapped then the person who was bitten or scratched must go through a series of expensive rabies shots. Raccoon trapping should be left up to the professionals at Reliable Animal Removal Inc. I found a baby raccoon in my attic. What should I do? First call Reliable Animal Removal Inc. to perform an inspection of the attic to make sure the mother raccoon is not still up there. If the mother raccoon is up in the attic then we will trap for that raccoon. We will take the baby raccoon to an animal rehabilitation center where it will be raised. Once the raccoon is removed how do you keep more from coming back? 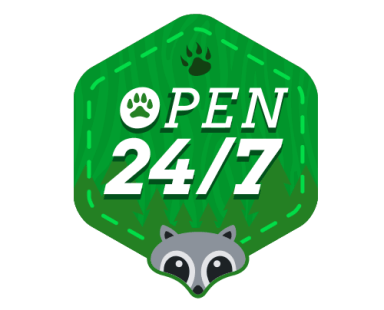 Once all of the raccoon trappings are completed, then Reliable Animal Removal Inc. will do a full exclusion on your home. Any areas where the raccoon was getting in your home or could possibly get into your home will be closed off. Reliable Animal Removal Inc. uses the best materials and any full home exclusion for raccoons comes with a one-year guarantee. I saw a raccoon walking around during the day. Does that mean it has rabies? Not necessarily. Although mostly nocturnal, raccoons sometimes utilize daylight to target a specific food source that is only out during the day. Mother raccoons that are nursing will often forage during the day as well. Anytime a raccoon looks sick or acts unusual call a professional trapper like Reliable Animal Removal Inc. or your local animal control. How many babies will a mother raccoon have? Raccoons will have litters ranging from 2 to 5. I hear noises in my attic. Could it be a raccoon? Yes. Raccoons are commonly found in attics. An attic is an ideal shelter for a raccoon. The noises in the attic could also be from rats, mice, opossum, gray squirrels, flying squirrels, large lizards, birds, or bats. I saw a raccoon go underneath my house. Should I have the raccoon removed? Yes. Raccoons can climb up walls into the attic creating significant damage. If a raccoon enters your house you should always have the raccoon trapped and removed. What kind of bait can I use to attract raccoons? Raccoons are omnivores and will eat a wide variety of foods. Each individual raccoon can have its own preference. A certain bait that works for one raccoon might not work for another. The professionals at Reliable Animal Removal Inc. are familiar with different baits and techniques to adapt to different situations. I live in a mobile home. Something made a big hole in my air conditioning duct work. Was it a raccoon? Its is very possible. Raccoons, opossum, rats and squirrels are notorious for digging holes in a/c duct work. Let a professional at Reliable Animal Removal Inc. perform an inspection and determine what animal did the damage. How long will it take to trap a raccoon? Each raccoon trapping session is different. Reliable Animal Removal Inc. usually traps raccoons for two weeks but may have the problem solved in the first night. There are multiple factors that take place in raccoon removal to determine how long it will take to trap the raccoons. If I trap the raccoon myself will you take it away for me? Yes. Call Reliable Animal Removal Inc. for different options in removing the raccoon.